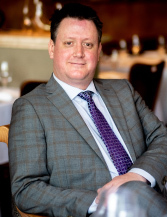 Andrew moved to Vancouver in 1999 and was actively involved in the opening of Cioppino’s as Executive Sous Chef, and then, took up the same role at West. He further honed his skills at Sooke Harbour House and the Carter House Inn in Northern California before accepting the Executive Chef role at Whistler’s Araxi. 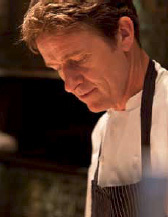 He later returned to Newcastle to open Laybourne’s Jesmond Dene House Hotel, performed an extended stage at The French Laundry, and then moved to Calgary to open the top-rated Blink as part owner. Richardson said, “I believe in simplicity, and the interaction of absolutely prime ingredients on the plate—the passionata, as the Italians say. Less is often more, especially in Italian cookery. Locally born and raised, Andrea discovered her love of cooking as a child when she lived abroad in Jamaica. While living on the island, she learned to have a true relationship with regional produce and a greater respect for animals. Her first steps into the professional world of cooking began at Cactus Club Cafe which led to a posting with Raincity Grill, where she worked her way up to Sous Chef while attending the Culinary Arts program at Vancouver Community College. 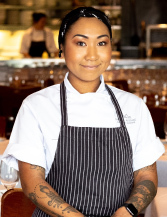 Following her time at Raincity Grill, Andrea joined Toptable Group at CinCin Ristorante + Bar as Chef de Partie, and now has earned her place as Chef de Cuisine of this award-winning brigade. Richard's engaging personality and passion for people have seen him work in virtually every restaurant position, both as a front-of-house server, bartender and manager, but also as a line cook and expediter. That diversified background is a useful tool for "understanding and facilitating all of the elements that make for seamless service," he says. As bar manager at Vancouver’s Lumière, server at CinCin’s sister restaurant West, and restaurant manager at Market by Jean-Georges, "I’ve been part of the choreography for years, and now I can really help direct it." Born in Oakville, Ontario but raised in Vancouver, Richard’s culinary enthusiasms follow the seasons: "I love spot prawns in May, summer salmon, and locally-foraged mushrooms a little later. But my favourite is autumn truffles—so CinCin is the ideal venue for me!" Raised in her mother's busy restaurant in Muskoka, Ontario, Elle came to know the essence of true hospitality. "My mother is a chef-proprietor and is the hardest working person I know," she said. "She instilled in me an important life rule: there is no such thing as a stranger once they enter your home." 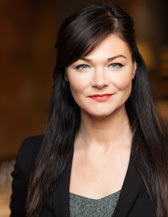 Elle studied at George Brown College in Toronto, where she received her degree in Hospitality Management, and has also completed her WSET Level II in wine education. She worked at a number of top-level Canadian restaurants before arriving at CinCin. Elle is continually pursuing the highest quality in service and food hospitality, and is proud to be a part of the team at CinCin. "I truly believe in the sense of community," she said. "Together with my colleagues, I want to create lasting memories for our guests. That is an honour, and one I don’t take lightly." A native of Prince Edward Island, Shane is a graduate of the Atlantic Tourism and Hospitality Institute and holds the WSET Diploma in Wine and Spirits. He recently qualified as Advanced Sommelier from the London-based Court of Master Sommeliers, one of the wine world’s most senior and prestigious accreditations. Upon completion of the Masters designation, Shane would be the only sommelier in Western Canada to hold this extraordinary qualification. Shane’s early days were spent at the Relais Gourmand White Barn Inn in Kennebunkport, Maine. In the U.K., he served at Glenapp Castle and Chapter One, both Michelin-starred, before moving to Canada in 2005 to join Araxi. 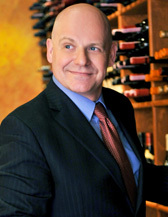 In 2008, he became Assistant Wine Director of another sister restaurant, Blue Water Cafe. 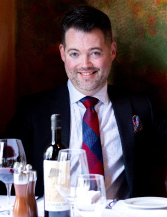 Now the consummate host and Wine Director for CinCin Ristorante, Shane won the third annual Canadian Association of Professional Sommeliers (CAPS) BC Sommelier of the Year for 2017. This rigorous competition saw Shane vie with fifteen other finalists in front of a panel of demanding judges to achieve this very significant distinction. A native of Ontario, Jamie moved to Vancouver in 1996 and "instantly fell in love with the city." He studied through the Wine & Spirit Education Trust, completing his Advanced Certificate before presenting his credentials at CinCin in 2002, where he has remained to this day. One of Vancouver's most popular service professionals, with a wide following of regular guests, Jamie went on to complete his Certified Sommelier degree from the International Sommelier Guild. Jamie and his wife Sachiko travel frequently, especially to her native Japan, where he admits to an ever-growing fondness for sake and Japanese cuisine. But his chief passion remains rooted in seeing the enjoyment of the guests he serves, and introducing them to "ideal wine and food pairings, on any budget, that truly improves their experience." In 2013, Jamie was recognized with the "Premier Crew Service Award" at the Vancouver Magazine Restaurant Awards. 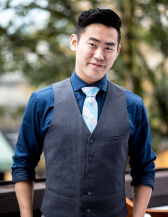 Shion is a Certified Specialist of Spirits from the Society of Wine Educators, who truly enjoys engaging his guests over CinCin’s famous downtown bar. He worked in a number of service capacities at Vancouver-area restaurants before returning to CinCin in 2015, where he has been mentored by some of the city’s finest bartenders. His enthusiasm for his new position is infectious and Shion strives to mix it up by drawing on his Japanese lineage. “The cocktail culture in Japan is a little different,” he says. “It’s a gateway to a different world, and when you enter all of your day-to-day worries should disappear.” And with every evening, Shion’s finesse with his cocktails and wine recommendations for his guests ensures that is exactly so.